For those of you who know me in “real life” or follow my Twitter, you may recall I’m a wrestling fan. (Sue me, I grew up in Calgary at the tail end of Stampede Wrestling’s glory days, and it stuck.) In each of the last two years, I went to WrestleMania. It was fun, especially New Orleans last year. In each of the past two years, the Flames were way, way out of the playoffs and on road trips, so I didn’t miss anything of note. Two years ago the Flames were even nice enough to trade Jarome Iginla before my trip, so when I got off the plane in Newark on trade deadline day, I turned on my phone, went “Oh, Blake Comeau’s gone?” and went about my day. For various reasons, I didn’t take the trip to San Jose for WrestleMania this year. By sheer coincidence, two hours before WrestleMania 31 kicks off, the Calgary Flames face a crucial test in the form of the Nashville Predators. It’s not Brock Lesnar versus Roman Reigns, but there’s a lot on the line for your local hockey heroes as they try to make the post-season. Puck drop is at 3pm MT on Sportsnet West and Sportsnet 960 The Fan. 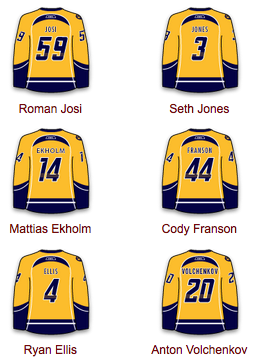 Hiller starts. He hasn’t started in awhile, but he’s quite good. It’s also a back-to-back situation, so perhaps they go with Hiller today and Ramo tomorrow against Dallas. There’s no game-day skate this morning due to the early game and Granlund was sick yesterday, so the lines at the actual game will be a jumbled mess. (Roger Millions tweeted his expectations for many game-time decisions, per Bob Hartley, who wasn’t pleased with his team’s intensity level against Minnesota.) One of Raymond or Colborne have to be coming out of the line-up eventually, right? Right? Much like Ric Flair in the 1992 Royal Rumble, not much was expected from the Calgary Flames this season. Flair started that Royal Rumble as the third entrant (out of 30) and the Flames finished last season 4th-from-last and didn’t really add much beyond rookies in the off-season. But now we’re into the nitty-gritty of the season, seven final games with the Flames still in playoff contention. And like a seven-game playoff series, the Flames need to win four to have a shot. The opposition may be tough, and will likely get tougher as teams get desperate, but the Flames have to match (or exceed) the desperation of their opponents. Or else they’ll be golfing on April 15 when the playoffs open. So, Nashville played last night, won last night and clinched a playoff spot last night. Hopefully for the Flames, they’ll be worn down. 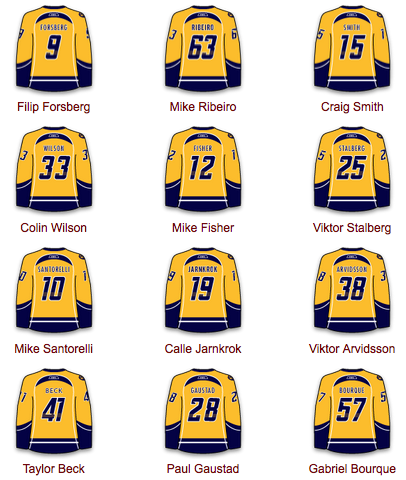 Pekka Rinne started yesterday, so we’re guessing that he’s off tonight and Calgary gets Carter Hutton, which would help. Shea Weber is out day-to-day with an injury. I can’t see them pressing him into service against the West’s 9th-best team, so I guess he sits again today to recover. The Predators are good. And deep. And can hurt you in many ways. The Flames will need to be good today and have their intensity and execution exceed that of the home side if they want to get two points today. We have Xs in the standings now! Two down, six to go. Seven games left. Six after today. Elimination numbers and magic numbers converging rapidly. Just win, baby. That’s all the Flames can do to keep their playoff hopes alive for another day. 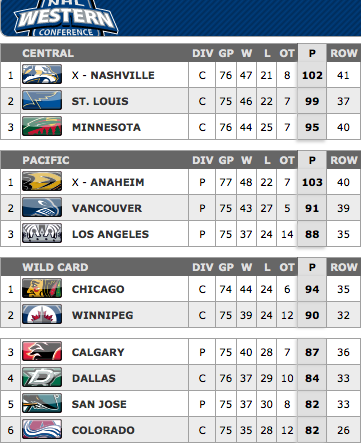 A critical two points given that LA lost to Minny yesterday. I don’t care if the Preds were on a back to back, we just beat one of the best teams in the league! Anyone feels Chicago are in trouble down the stretch if they don’t win tonight?